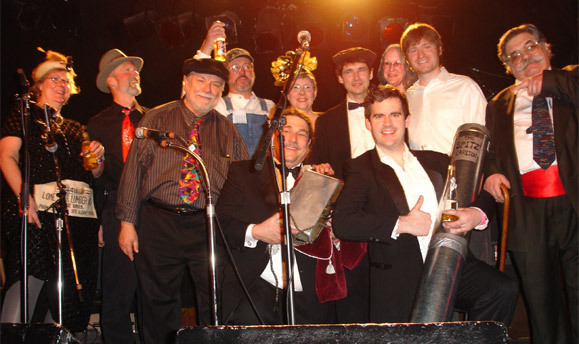 On Feb. 11, 2007, the Hump Night Thumpers celebrated our finest moment so far: victory in the 25th Annual Battle of the Jug Bands in Minneapolis. After a strong debut last year, we hit the top in our second try, and now we have the traveling trophy (a vintage 1938 waffle iron) to carry around with us all year. Scroll down for press coverage, photos, and a video of each of the songs we performed! The first Hump Night Thumpers performance was at an Old Town School "Gig Night."